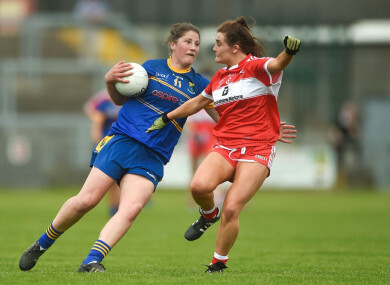 Jackie Kinch in action for Wicklow. Ellen Kinch was just 16 years old when she lost her two-and-a-half year battle with cancer. She was a talented footballer with Tinahely and Wicklow, and her sister Jackie is ensuring she keeps her name alive, speaking eloquently about her on today’s Ladies Football Show. Ellen passed away in 2007, and Jackie — now a key player on the Wicklow side herself — was 14 at the time. She joined the LGFA’s Jackie Cahill on this week’s programme to speak about the impact of her sister’s death. “It was a very difficult time,” she said. “Ellen was such a great person. “She was so happy. Her spirit, she was just really enthusiastic about everything in life. No matter what it threw at her, she was going to grab it by the horns and take whatever. The fact that she had that attitude towards it when she got cancer probably helped all of us as a family. She added: “When she was battling cancer at the time, the whole community got behind us and everyone helped. “Some of our neighbours organised a helicopter to bring her to one of our games. That just gives a sense of what community was, and how it helped all of us through it. Kinch also discussed using football as an outlet and the annual Ellen Kinch Memorial Cup — founded in 2008 — and its role in honouring her sister’s memory. Email “'Ellen was such a great person, it was a very difficult time' ”. Feedback on “'Ellen was such a great person, it was a very difficult time' ”.